We're wild about color! This month, we do a deep dive into our favorite hues, from an exuberant family home to a Midwest charmer in soothing neutrals. 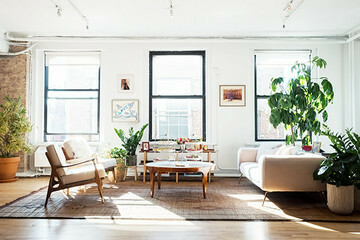 Also: Miles Redd, Charlotte Moss, and actress Jordana Brewster's edgy pied-a-terre. 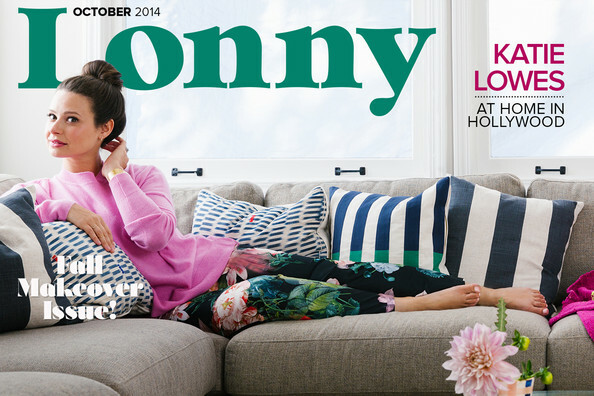 The March 2015 issue of Lonny is all about new beginnings: fresh and accessible family homes, our top shopping picks for spring, Lonny's Next Big Names in products and interiors, and our glowing cover girl, Molly Sims. Celebrate the season with our Holiday issue, starring Hollywood golden girl Camilla Belle. Also in the mix: a Wes Anderson–inspired party, decorator Tamara Kaye-Honey, and gifts for every design lover on your list. Glamorous cocktails, an autumn beach picnic, and homes from Paris to Brooklyn... Welcome to our Food + Entertaining issue, starring Parenthood's Joy Bryant. 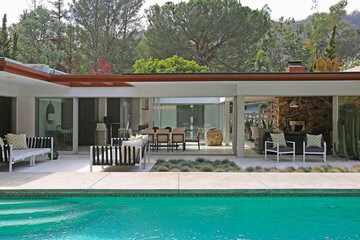 Presenting our Fall Makeovers special, starring Scandal's Katie Lowes from her Hollywood Hills nest. Also in the mix: actor Michael C. Hall, two Lonny editors' own small-space transformations, and home tours from Austin to New Orleans. Fashion and design: two good things that are even better together. Peek inside Josie Maran's Pennsylvania farmhouse; join the rose harvest for Chanel No. 5; meet the founders of fashion line Veronica Beard; and much more! 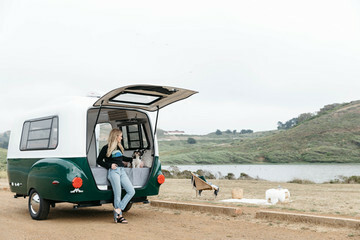 It's the summer travel issue—starring actress-musician Mia Maestro, a Buenos Aires native now making her home in California. Escape with us to Italy, France, India, Scandinavia, and more! 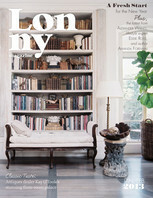 Celebrate outdoor living with Lonny's summer entertaining issue—starring designer Bridgid Coulter in her Los Angeles family home. 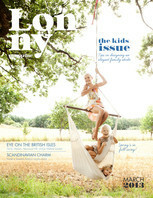 Welcome to the Lonny relaunch issue! Celebrate spring with our cover star, Cindy Crawford, in Malibu, California. Peek into the colorful Paris apartment of fashion designer Manish Arora; a sophisticated San Francisco family home; and the Sag Harbor escape of Michelle Smith, the decorating world's next big thing. We're back—and better than ever. 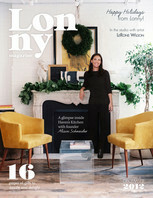 The December-January issue of Lonny is an ode to modern luxury, from a California coastal escape to a comprehensive gift guide with goods at every price point. 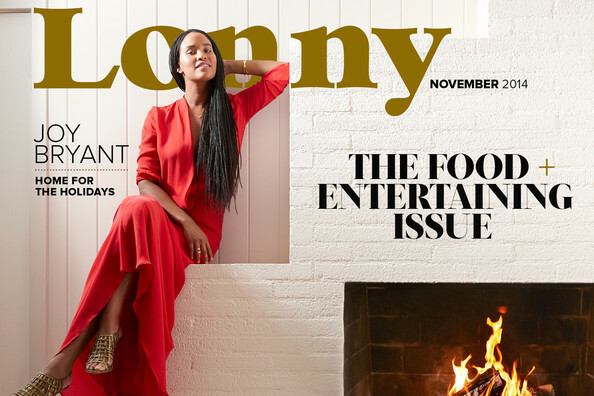 The November issue of Lonny is a sourcebook for the modern entertaining maven, from an event designer’s party tips to a decadent desserts primer. 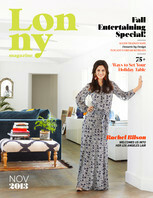 The October issue of Lonny is devoted to fall makeover ideas, from a Hudson Valley farmhouse to actress Jessica Alba's brand-new Santa Monica office. The September issue of Lonny is a love letter to the world of fashion, from Hollywood tastemaker Jacqui Getty to a Parisian museum devoted to couture. 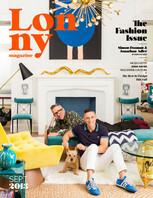 The July/August issue of Lonny is a celebration of summer getaways, from what to pack for a weekend escape to inspiring homes around the world. The June issue of Lonny is packed with inspired wedding ideas, from place settings and party decor to dreamy honeymoon destinations. From whimsical tablescapes for a garden-inspired party to a Mother’s Day brunch at Kelly Wearstler’s Beverly Hills mansion, the May issue of Lonny is devoted to spring entertaining ideas. For our April issue, we celebrate all that's fresh and inspiring in design, from a biodynamic ranch above Malibu to a Brooklyn floral designer whose arrangements evoke the essence of spring. 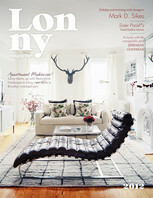 From a family home in the Scandinavian countryside to plush toys handmade by Kenyan artisans, this month’s Lonny offers an international selection of the finest in kid-friendly design. The January/February issue offers a fresh start for the new year, with inspiring spaces, tips on organizing and rejuvenating your home, and the latest in design. Our new December issue is overflowing with seasonal gift suggestions, festive entertaining tips, and the latest in interior design. Enjoy! 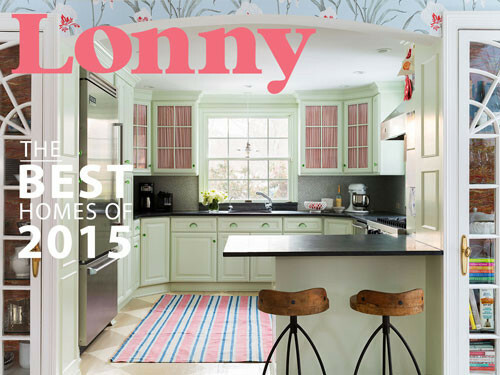 The latest issue of Lonny takes you home for the holidays, with fresh ideas for festive entertaining. As the Autumn chill settles in, cozy up with our October issue. 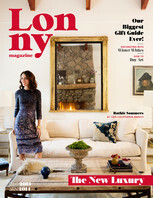 Lonny's 2012 Fashion Issue includes an exclusive glimpse inside Gloria Vanderbilt's Beekman Place art studio. Our International Style Issue includes the latest global goods, and tips from well-traveled tastemakers. 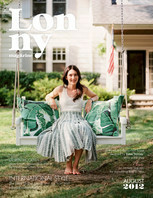 Our Summer Getaways Issue features stylish living spaces, both near and far.